As the founder of Substation33 it gives Tony great pleasure to see this Social enterprise continuing to grow and develop, expanding into new and exciting subsets. Substation33 provides meaningful work and skills development for volunteers and employees, and generates social returns for YFS and the Logan community. Tony's role allows him to combine his business skills with his passion for improving opportunities for people who are traditionally marginalised from employment. Tony started community work as a Youth Worker at YFS in Logan. Part of this role included engaging at-risk young people in “earning or learning”. They recognised a big gap in the opportunities available for young people to learn and work in a supportive environment, and initiated WorkCREW, a landscaping and property maintenance social enterprise. Tony's role at YFS developed into Social Enterprise Development Manager, allowing him to focus on generating more employment opportunities, not just for young people but for other people with significant barriers to mainstream employment. Tony's passion lies in creating sustainable social enterprises that create opportunities for people to participate in a supportive work environment as they develop the skills and behaviours they need to work in mainstream workplaces. As a result, Tony was the driving force behind the development and continued growth of the 'Independent Social Enterprise Network - Logan' as the founding and current Chair. In 2017 Tony co-founded the inaugural Logan Startup Weekend. Tony discusses why he believes social enterprise is the way of the future, shares thoughts on government policy and reflects on a range of community driven initiatives which are creating positive social change. [Tony Sharp] - I have been self-employed, had my own businesses for many years before I re-trained as a youth worker and went to YFS. My passion then, when I had small business was to engage with people that were disengaged from community living, because once you trained them and got them working, they were workers for life. It was really cool and I really liked to see, (personally it was about my DNA), people change and develop and I always thought there was that one percent out there that we can make a difference to and that's the reason why once I got sick of running a small business. Life changes and moves. So I wanted to do something different, so that's why I became a youth worker. The first thing that happened to me as a youth worker was we were engaging contracts from across the border to YFS, so it didn't take much brain power to work out that we could do this and use our local labour to get this to happen. That's really why I reinvented myself as a landscape maintenance contractor again. But I soon moved from that to Substation33 because my passion was about creating more of that stuff. 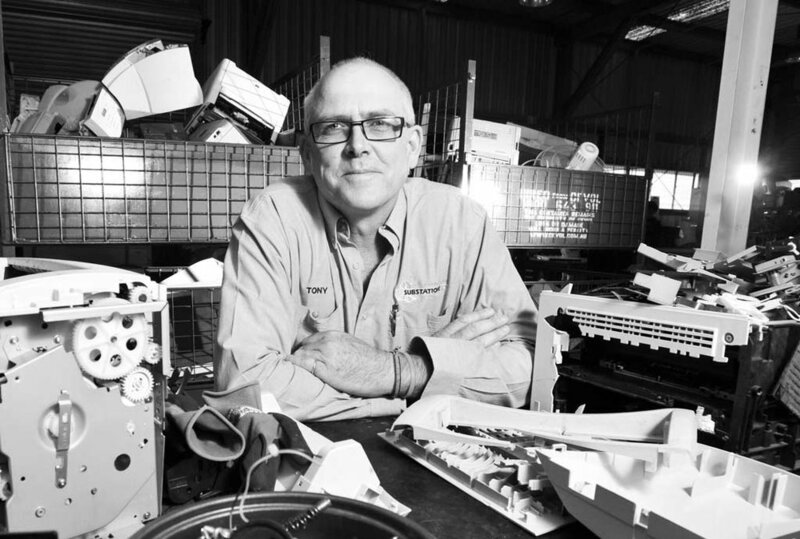 Substation33 collects and disassembles electronic waste as its primary focus, but its secondary focus is around creating employment opportunities for people. I thought we'd have three or four people here, working around. You know, we had 400 people here last year pulling apart electronic waste. Some people turn up for one hour, some people stay for four years or five years. But it's a really easy work. So, you know, electronic waste recycling is easy work. You pull it apart, you use what we class in industry as first break, so it's screws and clips. If you put the aluminium in the wrong bin, it was going to landfill anyway. What does it matter? Just get on and do it. So it's not anything to do really about electronic waste. We could probably do it with recycling cupcakes but there's not a lot of foreign cupcakes but there's a lot of electronic waste so that's why we chose electronic waste. So, more than 150,000 kilograms of electronic waste every year we recycle. But the interesting stat behind that Tom is that less than 5% ends up in landfill. So 5% that we can't find a home for it, ends up out in landfill. Well I'm obviously really well embedded in social enterprise in Logan, through Substation33. I think Substation33 is probably getting up there in social enterprises in this country. It's five years old and we keep finding more, that's really good. We keep reinventing ourselves which is good. I believe social enterprise is the way of the future. And the reason I believe that, is that I have so many people who turn up here and want to talk about social enterprise. And they talk to me about their passion about not working for the big fella but working for themselves and working for their passion. We've got to stop worrying about the almighty dollar and we've got to start worrying about our own selves and about supporting other people. And what a fantastic way to support another human being, is through Substation33 and similar social enterprises where you can work shoulder to shoulder with somebody; you're not supporting them, you're not doing anything with them. You're just hanging out with them and getting along with people. That's what I think a good social enterprise looks like. I don't believe that the first project they're going to take on is the one they're going to end up with. And so Substation33 is a very clear example of that. We thought we were an electronic waste recycling business who was going to produce four important positions over a 12 month period. 400 people have been here in the last 12 months alone. We create incredibly cutting edge technology. If you ask me about... I do code reviews. What does it even mean? But that's what social enterprise is about. It's just a business. Probably the words 'social enterprise' are overused in a way. This is just a business that's going to go at 100 miles an hour. You've got to keep up with it. But it has a social tilt to it. So the social tilt is we take in and look after people. And that marginalised person might have been unemployed for five years, might have this incredibly buried and talented skill set but just has never popped itself to the service because they've never been in the right place. Substation is not for everybody, I'm not saying it is. But for the people that love Substation33, they grow, flourish and develop all the time they're there. So certainly high labour content work that can be ostracised off for social enterprise. Logan City Council has a very clear mandate on that now and it's been developed through the Independent Social Enterprise Network's work that we've been doing with Logan City Council and some of the work that's been done at Gold Coast and Brisbane. And so typically, what would happen in a large Council area, would be they would say that there's a 5% waiving on contracts... So let's look at some work that would be very easy for social enterprises to do. I'm not only talking about electronic waste recycling but I'm talking about landscape maintenance, I'm talking about catering, I'm talking about parks, I'm talking about utilities planning. I'm talking about the work that's high labour content and that's entry level work. So we can teach long-term or marginalised people or school leavers that have been unemployed for a while, how to pick up rubbish. And I'm not saying this is demeaning work, all I'm saying is it's work that we can teach people skill sets on from the very beginning. So instead of pulling off the work and saying, "well here's a $100,000 a year contract and we're going to give you a 5% weighting on it." What I'm saying is pull that $100,000 contract out and say, "only social enterprise and true social enterprises can be contended for that work." There's still one million dollars worth of contract work out there for the mainstream boys, that's fine. So our job in social enterprise is not to become a large corporate, a job for social enterprise might be a training ground for people. So we teach people skills, we get people skilled up and ready to go. And we get people out in the mainstream world. So our aim is to show that social enterprise is active and vibrant and thriving in Logan. I believe that it needs to be community driven. So we class Logan as a community. So we've got 30 or 40 social enterprises in various shapes and forms in Logan. We need to work together to enhance that subset of business to move forward. I don't believe that we need to scale to multi-national scale level. I think it needs to be done in small, regional capacities. The business model of the Independent Social Enterprise Network of Logan has been duplicated on the Sunshine Coast and Harvey Bay because they're looking for the same thing. Probably not another community service but we're looking for a group of people that connect well together. So what we have done in the last two years and what we're doing this year in 2018 is a series of four workshops around topics of interest for social enterprises and in November time we'll have another social enterprise expo/conference/get-together. The highlights for the weekend for me is I met Ayla Soutar less than eight weeks before he watched this thing. And in eight weeks we got it going. That was the highlight for me. The other thing that stuck out for me was the fact that typically startup weekends are done in large cities, in hired spaces and I really wanted to experiment around bringing some more practical skill sets to the start up weekend and have it in a regional city. In a lot of cases, Startup Weekends finish on a Sunday afternoon at five o'clock and they all go back and then they never see each other again. So here at Substation, we're open all the time. You can turn up and tweak that odd concept that you want to do. Or have a conversation with the person that you met at the Startup Weekend. So I'm interested to find how we go in the next 12-18 months in that space as well. Yeah, it will be really, really interesting to watch. I'm not too sure about what we'd do differently. Maybe give ourselves a bit more time and prep. That probably how we work best isn't it? Just on the molly. Give yourself a deadline, work to it and get it done. Yeah, just get it done. So certainly from Startup Weekend is Powerwells, it's front and centre for me. I love Substation. Substation is a great thing but Powerwells will surpass Substation's every expectation without fail. I love Substation. Substation is a great thing but Powerwells will surpass Substation's every expectation without fail. The boys have done a really good job. So for those who don't know, Powerwells is a power well. It's built on the back of the old fashioned water well. A well is a community gathering point. It's a place of meeting, it's a place of gathering and communication in third world and developing countries. They're using mobile phones but there's no electricity, so the Powerwell goes back to basics. It's a well of recycled lithium ion batteries, it's powered by solar panel and underneath that solar panel is a recycled LED light. So at night time the kids can come and gather around the Powerwell and read a book or get educated after hours. It is also a place where people can charge their mobile phones. We thought this was a good idea. It was something that was conceptualised at Startup Weekend. And as I said, normally Startup Weekends, at the end of the weekend everyone disappears. Startup weekend ended the Sunday, the boys flew the following Tuesday, they installed a Powerwell in a remote Indonesian village on the Thursday and they came back home on the Saturday morning. Now that's a Startup Weekend. That's a project that's coming out of here. And when they got there and they worked out that the local villages... there's more than 1,000 villages with more than 100 people have no electricity but nearly every single individual in that village has a mobile phone and they use that mobile phone as a source of light to read a book at night. And they walk two days to charge that mobile phone. This is all falling into place. So I'm not talking about something that we're going to go and reinvent the world or change what they're doing. Powerwells wants to educate people in recycling laptop batteries and turn them into a power source. And they want to build that in the village and send it to the next village. That's what they want to do which is really cool. So Powerwells, get on it! I can give you two. So the first book was a book I read when I started doing youth work and that book is called, "The Boy Who Was Raised As A Dog". It's a psychology type book, not too heavy, not a lot of reading. It was just about the trauma that can be with you for the rest of your life if you've got really bad trauma when you're a young person. And for me, it just changed the way that I look at humans completely and it stuck with me forever. And it's a good book. The other book that I like, it's a series of books, it's called Encyclopaedia Britannica and the reason I like that really as well was because we were sold this when we were seven or eight years old and it was supposed to be a book for 20 years and it sat in our lounge forever and it was front and centre in our family home. And the competition was the World Book of course. But you know, those books were very rarely opened or they were opened as a reference book in our family home when I was a young person growing up. The interesting thing is now I have a piece of plastic in my hands that I can look at any book, anywhere in the world for free. And that is not 50 years. Where is the next 50 years going to take us? So every time I hear about innovation and change, I'm thinking, we have changed. Where is this thing going to end? You can contact Tony on LinkedIn, Twitter or Facebook. Please feel free to leave comments below.